Fire Queen Slot stands out from the standard video slot games you will find online. It is 1 of only 2 slot powered by the ‘Double Money Burst’ feature. It also offers nudges on wild reels in the free spins round. With 3 sets of reels and 100 pay-out lines Fire Queen Slot is very entertaining and makes a refreshing change from the standard games offered online. This page gives you a complete guide to the Fire Queen slot. The basics are covered first below, including the unique set-up. After this you will find details about the free spins bonus game as well as other bonus features available during play such as transferring Wild symbols, and nudging Wild reels. 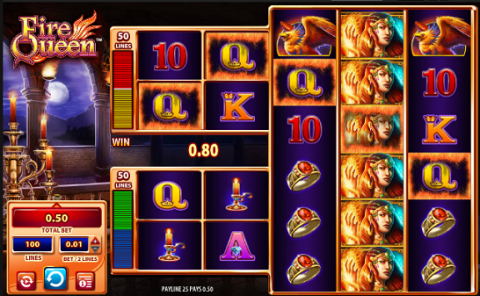 Next you will find my opinion of the Fire Queen Slot compared to other slots - and information on the slot’s compatibility with your desktop and mobile devices. You can find Fire Queen (along with many other WMS slot titles) under the 'Vegas' Tab at the award winning www.betfair.com - check this great game out for yourself now! Fire Queen Slot is a 100 pay out line slot machine with the reels set up in a way you will not have come across before. There are 2 blocks on the left of 2 reels with 2 rows. These are connected in multiple ways to a taller 3x 6 row section on the right. The right hand longer reels have blocks of symbols, which includes the ‘wild’ fire queen – so you can end up with a lot of winning lines at once. This slot includes the exclusive Double Money Burst engine which offers 6 unique ways to trigger the feature round. The minimum bet per spin is $0.10 and the maximum is $100. The Fire Queen Slots RTP is 95.95%, though the wins are bigger (via the feature) which puts this game into the mid to high variance category. The higher value symbols are the Fire Queen, who throws fireballs and big wins, a phoenix, a candle, a ring, horse, lotus flower, pendant and magic potion. The lower value symbols are the standard 10, Jack, Queen, King and Ace symbols. The Wild symbol in the Fire Queen Slot is surprise-surprise the Fire Queen. She substitutes for all other symbols except for the Mystical Ball scatter. If she lands on one of the reels on the left-hand sets she can transfer to the other small set of reels. If she lands on reels the far right-hand set of reels she expands. Here the animation is amazing. The whole ambience of the game is one of magical mystery, with the anticipation of a big win keeping you entertained throughout. The graphics and colours are superbly designed, which is standard with William Interactive software, and the background music is like something out of a Harry Potter film. The Fire Queen Slot bonus round not only offers you a number of ways to win free spins but you can also trigger an up to 100 x multiplier. If you match 4 Scatters on the small top-left set of reels or the small bottom-left set or both, then you trigger 5 free spins, the same applies if you land scatters on the big reels to the right. If you are lucky enough to land 4 matching scatters and 3 more on the other reels you are awarded with 20 free spins. Anything you win from the free spins can be multiplied. Finally if you get 3 Mystical ball symbols on the right-hand set (the 3 x9) you will win an extra 5 free spins. Although this is the only bonus feature that can be triggered in the Fire Queen slot it is still exciting because unlike many online slot games there are 5 ways to activate this bonus round. The Wilds, the transferring Fire Queens, the free spins, the Mystical Ball and the Free Bonus Round will keep your bank budget topped up ready for the big pay out. How Does Fire Queen Slot Compare to Standard Slots? The Fire Queen Slot is a very different and unique slot and does make a refreshing change from the standard setups. The potential for that 100x multiplier and multiple wins at once is what keeps the game interesting. The downside is that there is no break-out game or bonus round, with free spins being the order of the day. What I like best about this game is that WMS are bringing their live slots expertize to the online environment. Anything which breaks the mould of ‘yet another 5 reel video slot’ has to be welcomed! It is possible to play Fire Queen Slot online on your PC or Mac and because Williams Interactive uses HTML5 technology the Fire Queen slot is available to enjoy on both your Android and iOS devices.Though this game does not yet appear to have been transferred to mobile phones.